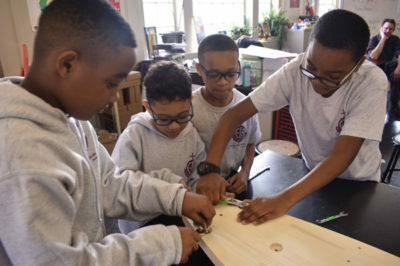 Emmanuel’s Soap Box Derby Team officially began building their stock car for the May races. We’re all excited to cross the finish line! The team is 3rd through 5th Grade learners exemplifying Godly character and a 3.0 G.P.A. or better. Emmanuel’s team is working with Soap Box Derby expert Mr. Bose. He is teaching them how to use basic tools and recalling the names of tools and pieces to complete the car.